A lot of people say “Live in the moment”. A lot of people don’t, and a lot of those people are the ones who are saying to do it. But what does it mean to live in the moment, and why is it so hard? Why am I getting bombarded with “What will you do when you finish?” and not “What are you doing right now?” I put myself in the group that says to live in the moment and often find myself not heeding the advice. I think there are a few reasons why “living in the moment” is hard for us. And “living in the moment” might not be the best way to say it, for it’s not “living” because if you are alive than you are living in the moment but rather, being aware of yourself, your surroundings in the present moment. Wording it this way I think makes it easier to see why its so hard for us, because if you are aware of yourself in the present, than you are aware of how you feel or don’t feel, how you perceive you look, talk, act, etc. It means acknowledging your existence always and if you don’t accept yourself, constantly being reminded of that which you don’t like about yourself. This is not something we like doing unless we are paying a lot of money for someone to sit there and scribble notes. The second part implies being aware of our surroundings, which also implies slowing down. And that’s one thing we, at least many Americans, don’t like doing. We like it fast. We eat fast, compute fast, talk fast, breathe fast, live fast. And then we say we don’t have any time to do the things we want to do. If we are doing everything so fast, where is the time going? To be aware, alive, in the moment seems to mean that we have to accept ourselves and slow down. Otherwise we might keep going and going and going and one day not be able to go anymore and not recognize the person we see inside. We are strangers to ourselves and to the world we live in. Just think of a walk or a drive you do every single day, and think of all the things that you don’t see because you are speeding by, or your head is down. Onward and upward. Let’s talk about now. Now it is the end of March, one of the longest months in the year. The weather has warmed up a bit here in Cachaço, for two weeks we had tropical weather, warm sunny days with nice little breezes. Today the clouds have swooped back in, but it’s not as chilly as it had been a few months ago. It is near the end of the third month that the Cape Verdean government has taken over paying for the Parque Natural Monte Gordo project. While I have my doubts about how the UNDP runs a project, they certainly have a bigger budget than the CV government does. For the last month our phone, fax and internet has been cut off due to a lack of funds. I await the day that we have no electricity. On my side, I am working on some marketing for the Casa de Ambient and normal daily functions with the staff here, but no big projects or anything like that for me, not with the Park as of now. BIKE PROJECT: I know I’ve said it before, but another plea is needed. This time it’s different though. 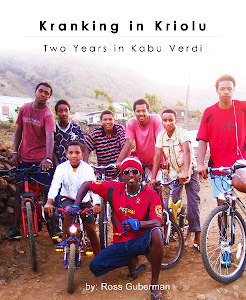 We have purchased and shipped 72 quality bicycle helmets to Cape Verde. They should get here sometime in April. However, shipping costs were a wee bit more than thought, so we are in the hole. $231 dollars to be exact. But what is $231? Well, that’s $23 dollar donation by 10 people, $11 dollar donation by 20 people, or a $231 dollar donation by one person. I leave it to you to figure it out. But awesome Cape Verde Bicycle Organization shirts (men, women, and children sizes) and messenger bags are still available. Easter is coming up, and so is Passover. Think about it. Also, aside from my bike project, Sonadei is working on sponsoring many bike races and charity events, bike film festivals, etc etc. Check it all out at www.sonadei.com. The “Filmed by Bike” festival is really cool and helps support not only bike riding but budding artists, a double whammy. Not a bike racer you say? That’s ok, because Sonadei does more than just sponsor bike racing. Like my bike project, Sonadei helps to support biking and bike communities, through sponsoring, shirt designs, or helping raise awareness of an event. 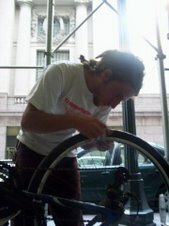 In the US, there are a lot of people doing amazing work on helping create a better biking climate in cities and rural areas, or helping kids learn skills through bicycle repair, helping recycle junked bikes and spare parts into ridable bikes to help inner cities or poor communities. There are people out there shinning shinning, and many more trying. Stay tuned to Sonadei to learn more about these people, these groups, these communities, these budding artists and bikers. BOOK: Similar to the Manhattan Project (except I am not developing an atomic bomb), the book lies in secrecy, well developed lies and government propaganda. Several fake books may be published posing as my book. Or maybe that fake version is the real versions. Maybe the book is already out but written under my pseudonym, Ray Finkle. Or maybe, just maybe, I am still working on the book with Sonadei writing sections, developing the layout, pictures, photos, etc etc. But that’s doesn’t sound as exciting. Women’s Craft Project: Thanks to the Portuguese language being so difficult and not English, we are still translating the English proposal into Portuguese to try to get some local help. FYI, you can see the English proposal in my google documents, not sure how you get there and then email me if you want to help out. I think the part of “helping” got lost somewhere as no one has offered help beyond the few people who have offered materials or help. Carberinho: Hot Dog! Something’s actually happening. The final report has been finalized and soon will be shipped off to Praia for those government fat cats to brood over it. I am still doing stuff with Amigos Unidos, the youth group here in Cachaço, and I hope that soon we will have a foosball tournament and that the group will purchase and sell some of the bicycle shirts and bags. Outside of that, I am just being a Peace Corps volunteer living and sharing in my community, the real meat and potatoes of being a grassroots community volunteer if you ask me. Naturally, until then, keep biking with your head up (and a helmet on).